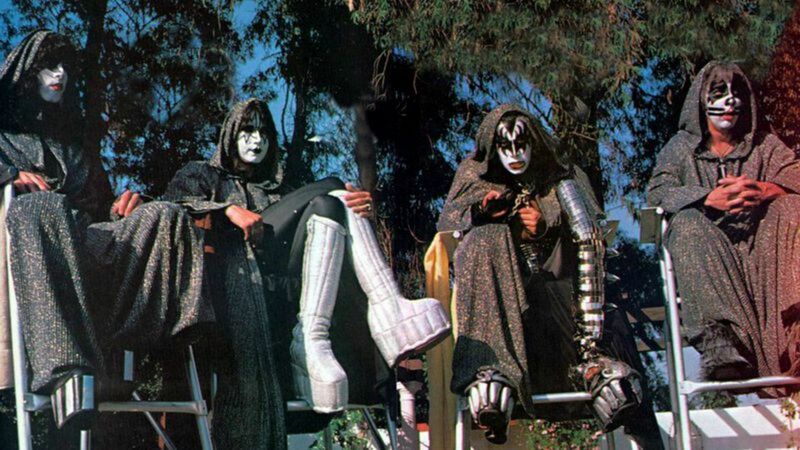 Forty Halloweens ago, members of the KISS Army across the nation gathered around their rabbit-eared TV sets for what was supposed to be the television event of the year. It was Hanna-Barbera’s KISS Meets the Phantom of the Park, starring everyone’s favorite rock ’n’ roll ’70s superheroes — the Starchild, the Demon, the Space Ace, and the Catman — at the absolute height of their fame. But while the $3 million NBC production, lensed by Hitchcock protégé Gordon Hessler, was the second-biggest TV movie of the year (behind Shogun), it was initially despised by critics, fans, and even the band members themselves. And it nearly derailed KISS’s career. The utterly bizarre fantasy caper depicted the members of KISS miming to prerecorded hits at a Six Flags Magic Mountain theme park concert; kung fu fighting with evil animatronic look-alikes, various robotic furries, and a mad scientist; and displaying such comic-book superpowers as teleportation, mind control, and shooting laser beams from their eyes. So of course it has now reached cult-classic status, just like another how-did-this-get-made holiday phenomenon released that year, The Star Wars Holiday Special. And while KISS reportedly refused to even discuss Phantom for years, the band members — especially the original Spaceman himself, Ace Frehley — now seem to have no problem talking about the infamous flick. Frehley admits that maybe the more clearheaded Stanley and Simmons were more critical of Phantom “because they weren’t loaded. Neither of those guys drank or did drugs.” The same could not be said for Frehley or KISS’s equally hard-partying drummer and original Catman, Peter Criss.